This is a three dose package of CrossBlock II for Dogs and Puppies. 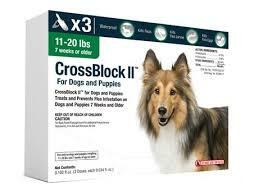 CrossBlock 2 treats and prevents flea infestation on dogs and puppies 7 weeks of age and older. It’s fully guaranteed and is a generic form of Advantage II. It’s an awesome flea preventative with trusted and well established ingredients. Active ingredients include: Imidacloprid 9.10% and Pyriproxyfen 0.46%.